Sancocho | Last week it was crazy cold outside. I never thought that when I moved to Texas the temperatures would dip below 25 degrees! Cold weather like this calls for a warm hearty stew. Something to warm the soul and fill the belly. Without a doubt, my favorite stew is Sancocho, which translates as stew. In Puerto Rico when a person has spent all day under the hot sun, it is said that they are “sancochao”, which means stewing in the heat. 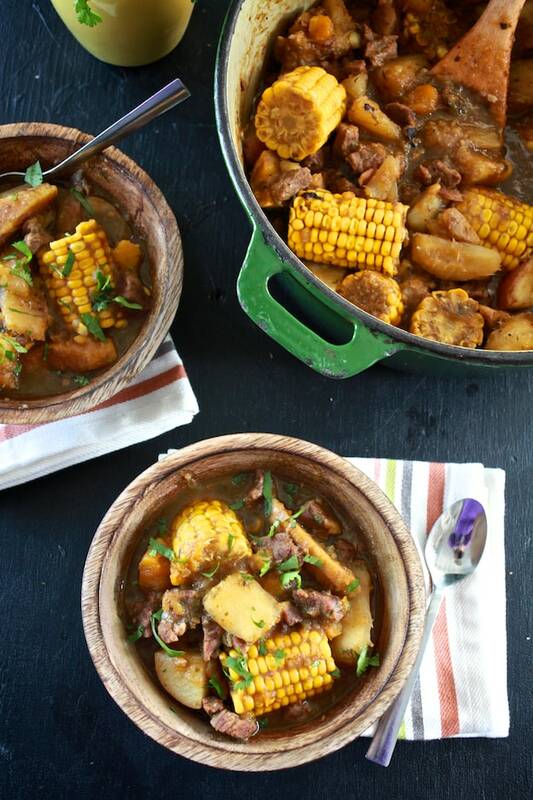 Sancocho is a satisfying stew with humble origins. Every country has their own version of stew. They would make a huge pot and let it stew all day and have a hearty meal ready after a long day of labor. Variations of sancocho can be found throughout the Spanish Caribbean and Latin America. Sancocho is made up of beef tips, beef stock and a variety of starches that are both native to the island and to Africa. Although plantains are associated with the Puerto Rican cuisine, the plantain is originally from Africa. 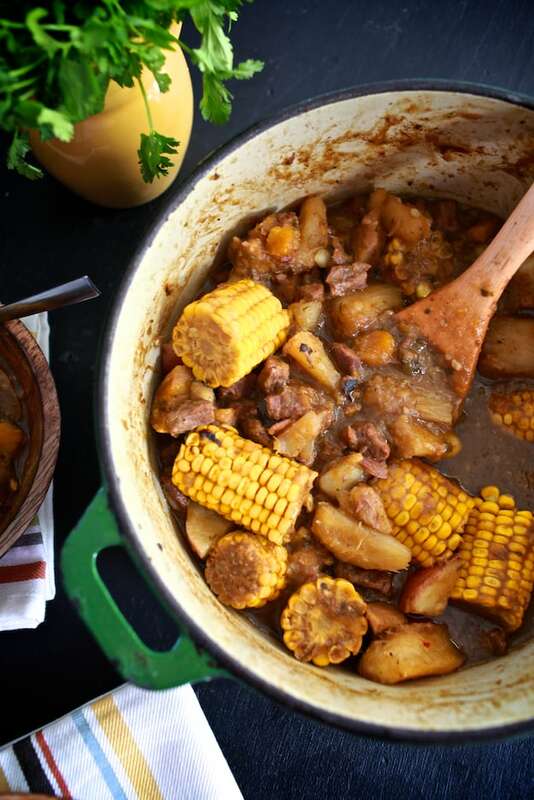 My favorite starch in this stew is the yuca root, which is native to Puerto Rico and was used by the native Taino Indians. Where to find Sancocho Ingredients? I have lived all over the United States and I know that finding these ingredients can be challenging depending on where you live. Of course, you can find most of the ingredients at your local Latin market. And, now many of the items including yuca and plantains can be found at any large chain grocery store especially if you are close to a metropolitan area. However, you may be surprised to know that many of the ingredients can also be found in a local Asian market. many Asian countries share a similar climate to the Caribbean so they carry much of the same produce. I was lucky enough to find frozen yuca at my local Asian market. If you can’t find something it’s ok to swap out root vegetables with what is available. If you are missing something, add a little more of something else, but do not leave out the corn. The corn is one of the best parts. I always save my corn for the very end; it is almost like a savory dessert. I remember when my sister and I were young we use to fight over the last piece of corn in the pot. She is a scrappy one, but I didn’t go down without a fight. This stew is just heaven and reminds me so much of home. OB was very excited to come home to a huge pot of sancocho. It is very filling and bursting with flavor. Especially on a cold rainy day like today. If you have any left, refrigerate it and save it for later. This stew is even better the next day after it has been marinating overnight. I think Obed, and I ate from this pot for three days. You can also freeze it in portions and have it on hand for a cold rainy day. To me, it’s a little piece of home in a bowl. Although yuca and plantains can be found at many chain grocery stores they can also be found a local Latin and Asian markets. Prepare a double batch if possible for leftovers and easy weeknight dinners. Leftovers can be portioned and frozen. Sancocho is often served with white rice. If you are craving something a little lighter try this chunky roasted tomato soup. But, of course, everyone loves a classic sopa de fideo con pollo (chicken noodle soup). If you want something hearty and loaded with aromatics and spices you need to try this Moroccan Lamb Stew with Harissa and Garbanzos. 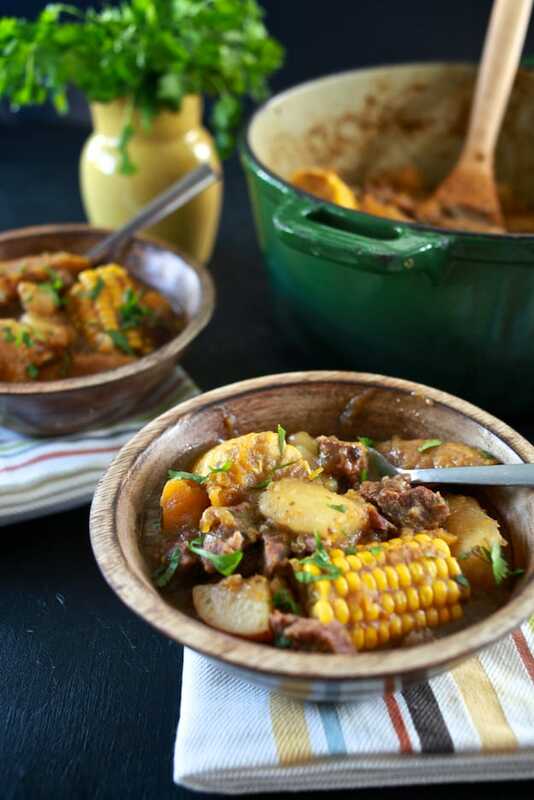 A hearty beef stew filled with starchy vegetables like yucca and plantains. In a preheated dutch oven or heavy pot over low-to-medium heat, combine olive oil, garlic, beef cubes, and onions, stir until beef is brown on all sides and onions begin to caramelize. Add in chopped pepper, cilantro, salt, pepper, and 1 quart of beef stock. Cook down until stock is reduced by half about 20 minutes. Stir beef, then add all the remaining vegetables and remaining beef stock. Bring to a boil. Lower to a simmer and cover for 30 minutes. I need a substitute for the yucca. Not being able to find it. Hi I was wondering if this could be made in a crockpot. If so how would you do it? I feel that the crockpot would make the meat more tender but would the veggies over cook if put in all at the same time? I really wish I could have eaten everything you picture – the stew looks SO rich and comforting! Gosh this look insanely good! The flavor is amazing! The dish has many versions depending on the various countries who enjoy it. I’m Puerto Rican and know our history very well. The Taino indians had their own version of a one pot stew made of root vegs. and fish or guanajo which means turkey. 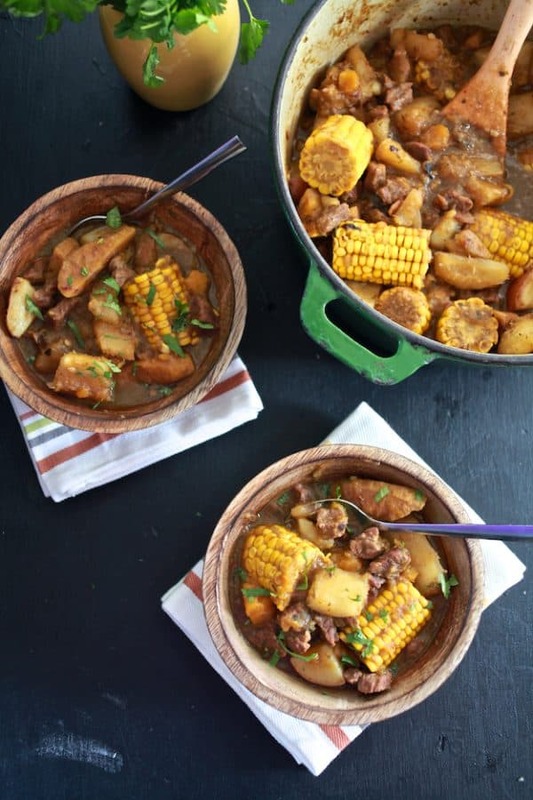 The name of this stew is Ajiaco and Cubans still call their Sancocho by this name. When the Spaniards arrived they formed the first European Fortress on the island of Hispanola known today as the Dominican Republic. They did not built any towns in Puerto Rico until 15 years later. In any case the cuisine of the Tainos and the Spaniards began to mix just as the people did. by 1511 Africans arrive in large numbers under slavery and the cuisine and people mixed further. Again each island has their own version. The Puerto Rican version uses tomato sauce and olives. The Cuban version used lime juice at the end with a little aji or hot pepper. The Dominican use various types of meat all together. They are all great and reflect the differences and common origins of Cuba, Puerto Rico and the Dominican Republic. I can’t wait to make the Sancocho for my husband, he is Puerto Rican. This is about the 4th time I’m making a variation of this recipe and I just noticed that you have tomatoes in the instructions part but not in the ingredients list. Is that a typo or should I be adding a certain amount of tomatoes? It’s been amazing every other time. Thank you for sharing it! I enjoyed your beautiful description of how this recipe evolved. I am American-born of Puerto Rican parents, and only recently became interested in cooking this dish. I love soups and stews and this one has become one of my favorites. Your recipe is the best I have seen and I thank you for it. Just a deep soup bowl! You may serve it with some white rice on the side to spoon into the bowl. In the directions it says to add the tomatoes, but there’s no tomatoes listed in the ingredients….can someone please clarify? Tomatoes are not necessary for this dish but tomato sauce is. Great recipe! I have everything ready to do my sancocho tomorrow. Since we are watching calories and fat, I am using chicken. For the starches, I am using what I was able to find in the local stores (corn, potatoes, carrots, celery, ñame, sweet potato, and some pieves of green bananas). i will cook white rice and I bought some ripe avocado to serce with it. Traditionally, my grandmother used to cook it with beef or ham (w bone); this last one was my favorite. You do realize that the Spaniards came to PR first, right? You have to read history to know that. It’s traditionally a Spanish dish, but all of the islands claim it to be theirs. Fine with me, but I swear Dominicans and Puerto Ricans are always bickering over nonsense, and should enjoy the fact that our culture is the richest of all. I hate to burst your bubble buddy however, the Sancocho, is made in several latin American country. It may fill some with pride, saying that Sancocho, is Dominican, in its origin however, that is not the case. -Sancocho (from the Spanish verb sancochar, “to parboil”) is a traditional soup (often considered a stew) in several Latin American cuisines derived from the Spanish dish known as Cocido. Variations represent popular national dishes in the Honduras, Canary Islands, Mexico, Ecuador, Colombia, Panama, Peru, Dominican Republic, Puerto Rico, and Venezuela. It usually consists of large pieces of meat and vegetables served in a broth. There are similar dishes in other countries, such as Bouillon in Haiti. Sancocho is made all over the Caribbean and did not originate in DR. Sorry. Yes you are correct ….the problem is that there is more than 20 Dominican Quisqueyano restaurants in Puerto rico …so this a big problem now they want to claim our dishes ..this is a fact ..I met a lot of puertoricans and did not know what was sancocho you meet one Dominican and dont matter where we at it can be in Alaska,Europe ,Asia ,Arabia,and is our tradition to do sancocho you ask a 3 year old with any Dominican heritage whether you are born in New York or India and the child knows, I experienced this I lived my whole life in New York where there is all cultures ,people travel and you will see …! Estas muy equivocada.. de costumbre por falta de educación, respeto, y por baja auto estima de una gran parte del pueblo dominicano, adueñandosen de la gastronomía puertorriqueña. La gastronomía de Pto. Rico ésta bien documentada, no solo en Puerto Rico y en España, pero también en el archivo de Holanda. It is Puerto Rican. I am sure there are different variations of the recipe, but it us a traditional Puerto Rican stew. Every Caribbean island has a version of Sancocho. My husband is West Indian and he grew up with a similar style , except they also put dumplings and other meats such as chicken and they call it soup. I did not know Dominicans invented sancocho. Good to know, since so many countries make sancocho. Maybe someone should let them know too. God Bless You and your Blog/Website. I have finally found heaven, I’ve been in many websites trying to find real Puerto Rican cooking and I finally found it. Thanks your recipes are the greatest. I noticed other websites & recipes call for water but this one doesnt. Are you supposed to add water or not? Also how much yuca should I add? I discovered this stuff during a recent trip to Puerto Rico. Delicious. However, I have a few questions. Top round can be a little tough and dry when cooked, even in a stew. Has anyone ever tried chuck instead? Also, it takes about two hours to cook the meat. Even though the recipe calls for cooking the meat 20 minutes extra. It seems like the potatoes, and maybe other starches, would be falling apart by the time the meat is done. Thoughts? Experience? Finally, I assume green and yellow plantains are simply the same fruit in different stages of ripeness, correct? Love this recipe! My husband is Ecuadorian and they also have their own rendition of sancocho, but he loved this one! Thank you for sharing! Looks delicious. One bowl of this and ill be sweating and dizzy. Whew. Thank you for this awesome treasure that I never learned from grandma. I will cherish this recipe. You rock, and love the history added as well. Just a random question, but you talk about yucca and that is mentioned in your pic, but the recipe you posted didn’t have it as an ingredient… Where does it come in? I noticed that as well I put in the yucca with the rest of the veggies, it turned out great, yum. How long do you cook it once you get all of the vegetables in? Could you use a crock pot? My beloved “mami” passed away this past July and I never got to write down her sancocho recipe when we made it together. So thank you for this!! When “mami” made it though she always made it with a piping hot pot of white rice..then the way it was served was your bowl of sancocho in front of you and a bowl of white rice alongside..you’d scoop a spoonful of rice into the sancocho and lather it…Ay.. Yai.. Yai QUE RICO! !..sweet memories of Mami…. joann my MOM also went home with GOd Spet and same happen to just know they are well now and this wedsite is great, GOD BLEESS! I’m glad to find this blog for Puerto Rican dish. I’m a Korean mom and my son has some Puerto Rican friends here in South Korea. Actually, They are U.S soldiers. I want to make this stew for them but some starch ingredients are not available here. Is it O.K. to make it only with potatoes, sweet potatoes and pumpkins? Greetings, kwon Jwon! That is great, that you are going to make a stew, for your son’s friends. I have not eaten this dish, for quite a while. I sure miss it. I was surprised to read about a Korean mother, cooking for her son’s Puerto Rican friends. Here I am in Los Angeles, California, that has a large Korean community. I am also Puerto Rican and just love Korean food (Love Bulgogi)! I love the culture, the food, movies, dramas series, etc. I hope to visit, next year. I am not a professional cook, or a great cook, for that matter however, if you need Puerto Rican recipes, please feel free to contact me. ????? Sancocho is a Dominican dish, it should not be labeled “Puerto Rican beef stew”, that is innacurate and misleading. Stop all your hate. PUERTO RICO WAS FIRST. All of a sudden they invented everything come on. It was first brought to us by the spaniards we made it our own, DR, later copy just as everyone else. Yet another Dominican going up against PRs…wow….I thought we’d left all that bickering behind. I guess not. anyways, The Spaniards came to PR first as PR was the first island to be discovered before the country of DR was. No need to hate, it’s Geography. Obviously Columbus came to PR first, then Hispaniola(Haiti/Dominican Republic) or was it Cuba? If you do your research you cannot even find these “carribbean” ingredients in Spain. So how could the Spaniards have brought it to anyone!!!! The Spaniards brought ingredients that were found everywhere around the world through their voyages. AKA Spice Trade. They traveled back and forth through the Atlantic for much more than that of course. Did you not read meiseidy’s breakdown in the top of the blog it was the Africans that made it happen and they served it to the Spaniards . The Spaniards did not do the cooking that’s what they had the slaves for. Actually the sancocho is an adaptation of the slaves of the “cocido” from Spain mix with the cassava (yuca) from the Taino Indians from the island. The Dominican sancocho was another variation of the dish and as we became closer as neighbors so did our recipes but still have a different seasoning for each one. We are neighbors and very similar in our cultures and our race but the beauty in all this is that each of us have always something that makes us stand out from one an other! Like our mofongo and your mangu….and from our brothers/sister neighbors of Cuba the fúfú. Very proud of been caribeños! Sancocho is NOT Dominican. Sancocho means STEW. Unless this is were a STEW and the whole world owes STEW to Dominicans. I am sure, STEW did not originate here. Making sancocho today for my lovely Puerto Rican wife of 30 years. Whenever I travel to PR before la playa and El Yunque is the market. The vegetables, the atmosphere are all wonderful for a country boy like me. I’m using short ribs, some cilantro from my greenhouse, yucca and plantains from the store. Ay que rico! gracias. :drool: que ricoooooooooo! Can’t wait to try this out as soon as I have yuca y platanos en casa! How come yucca is not in the recipe ingredients? When do I add it? Wow! Incredible recipe!!! I just made it and it made me remember my grandma’s. Hey Meseidy, I am 22yrs old with 2 children & I grew up with comfort food like this & would love to share that with my children. I truly am grateful to have your website where I can look for my PR recipes since my grandmother has been ill & is unable to teach me. My mom cooks wonderfully hispanic for a %100 irish woman lol but nothing beats abuela’s cooking! I was just wondering if in this recipe chicken breast can be used instead of beef, because my fiancee isn’t a fan of beef? Thanks for all the wonderful recipes that bring great memories to me! Traditionally it is made with beef but you won’t get in trouble for making it with chicken, you could try pork also. Meseidy is right, my family has almost always made it with chicken. I think it really depends on which region of puerto rico you’re also from. In our case, my uncle Demo has a farm and raised a lot of chickens there, so there was always plenty of chicken around to be had, whereas, killing a cow every time we wanted sancocho just wasn’t as feasible (where would we get our milk, right? haha). Anyway it makes me happy to see that this recipe was featured in tastespotting, because it’s always nice to see a piece of home recognized by more cultures. Living in Canada, I’ve encountered people who don’t even know that Puerto Rico exists, or that it’s even as close as it is. Thanks Meseidy! Hi Meseidy, my wife, mother, and me where wondering where is the Asian market you referred to in your “Sancocho”, as we also live in Tulsa and don’t know of any place where to get Yuca, platano, etc. I am also from Puerto Rico and got the itch to do your recipe. Love your blog. I made this stew over the weekend. I loved the contrast of flavors; sweet potato with new potatoes, tostones and plantains. It was delicious. I’ll definately make it again. Me diste donde me duele Meseidy. QUE delicia! [: It has been raining over here too (Lares, PR). I think I will be making this Sancocho tomorrow. I love sancocho though I thought its origin was the Dominican Republic. I guess their early histories are so similar that it’s a shared dish. Hearty as it is, makes me think of the way “Cocido” is made in Spain… I definitile love it more as I get older… seems that soups and stews are easier to eat with a spoon! And also they are comfort food when the weather gets chillier! Love how you introduce us you Puertorican food traditions! I love this. This looks so hearty and so perfect for the weather I’ve been experiencing. I love old world recipes. My grandmother used to make it and I never had a chance to get the recipe!